LED (light emitting diode) lighting is one of the latest lighting technologies to emerge in the hobby, and one that I'm excited about. LEDs are vastly more efficient that other types of lighting, produce much less heat, and if high quality electronics are used and effective cooling is used, last a very long time without losing much output. Whenever a new lighting technology comes along, hobbyists tend to attempt to compare it to a previous and more familiar technology. This time around, LEDs are getting compared to metal halide lighting a lot, but it just doesn't work. We all know we don't exactly use the scientific method in our hobby. Terms such as watts per gallon, intensity, and brightness get thrown around all of the time, even though they mean absolutely nothing useful to us or our coral. So, what's to be done? In fact, LEDs can't even be compared with the use of a PAR meter (the PUR of the diode is what's important!)! However, I'm digressing from the point: the point is that using MH as a tool in which to compare LED lighting to is misleading. MH lighting is a 'single point source light', meaning all of the light is emitting from one source in one location (in contrast, a fluorescent tube is a single source, but the light is emitted from the entire tube, not from a single point). 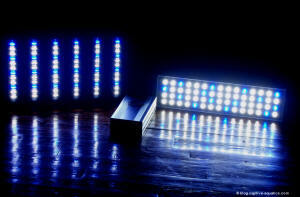 LED lighting, however, is 'multiple point source' lighting, which means several sources emit light from a single point. This is a huge difference in terms of how the light is spread in an aquarium! While MH lighting can be modified with a variety of reflectors to form a spotlight or to cover a large area very uniformly, LEDs are limited by their optics. Common optic reflection degrees are 45, 60, 90, and 120, with 45 appearing as a concentrated spotlight and 120 giving the most uniform coverage. Additionally, coverage can be (and often must be) adjusted by altering how high the LED fixture sits above the water's surface. Of course, wider coverage means less water penetration. Unlike MH lighting, with is excellent for both spread and depth penetration, LED light must be more tightly focused to accomplish this--again, because of it's multiple point source nature. If you are not familiar with LED lighting, purchasing the appropriate unit for the coverage you want at the height you want can be difficult--don't expect it to be as simple as purchasing MH lighting. However, the benefits of LED lighting are many, so don't let this discourage you! Check the manufacturer's website or reviews to see coverage recommendations, and while you're at it, check the spectrograph (don't buy an LED product if the manufacturer doesn't provide you with the spectrograph!). They should be willing to work with you, or take your business elsewhere. 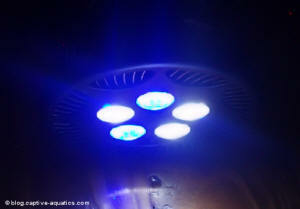 Ecoxotic Nanocustoms Nanotuners PAR 38 LED reef aquarium spotlight. Â© blog.captive-aquatics.com. Ecoxotic Panorama and Orphek LED reef aquarium lights. Â© blog.captive-aquatics.com. Another complaint often heard from those making the switch is 'my new LEDs aren't as 'bright' as my metal halides were!' ('bright', in this case, referring to the relative luminosity of the light, or how it looks to your eyes); even though the LEDs likely emit at least as much or more PUR as the prior MH source. This has to do with the way the human eye sees: different spectrums appear 'brighter' (more luminous) than do others. LEDs, especially ones used in aquarium fixtures, emit (or should emit) a great deal of PUR. However, most of the PUR for photosynthetic inverts like coral is not in the spectral range that the human eye views has highly luminous, meaning that the light appears dimmer to our eyes, even though it could be emitting more PUR for your coral than did the MH bulb. Sensitivity of the human eye to particular wavelengths of light, i.e., colors. Â© blog.captive-aquatics.com. 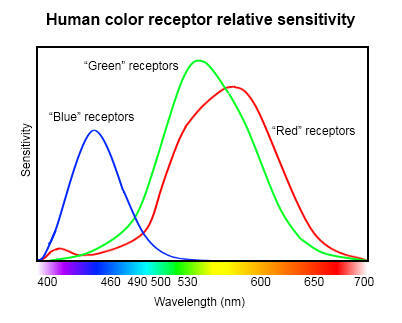 You can see from the image above that the human eye is not very sensitive to light in the blue wavelength (only about 12% of our color receptors respond to blue wavelengths) and as high PUR LEDs emit a great deal of their light energy in the blue spectrum, they appear less 'bright' than do other forms of light that emit more green or red. 'Brightness' (luminosity) is relative, and means nothing to coral! Want a brighter look? Use LEDs along with another form of lighting, or purchase wide angle LEDs with LED spotlights to produce dramatic effects with light and shaded areas. More 'shadowing' may occur with LED lighting than the aquarist is used to seeing, because each LED functions essentially as a miniature spotlight (not to be confused with LED spotlight fixtures), and LED light will not be as uniform in it's distribution as MH lighting is by nature of design. Although, have you been to a reef recently? Believe me, they're not uniformly illuminated. Once you become accustomed to the 'dynamic' way that LEDs illuminate an aquarium, you won't want to go back! In closing, LED a very promising technology and is most definitely the lighting of the future, and not only for aquariums. Keep in mind that LED lighting is still very new, and there has been an explosion of fixture models and a few different diode models from which to choose, which can be confusing. Many of the new LED fixtures are very cheaply made, so research before purchasing, but don't be afraid to make the switch!